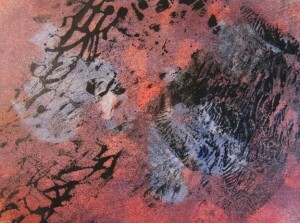 « Monotype Workshop with Akua Inks. 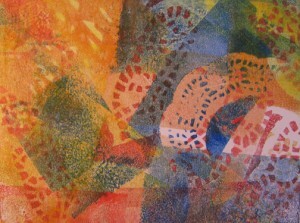 Think printmaking and you are likely to think press. You might conjure images of large, bulky contraptions, reminiscent of the Gutenberg press. Or, perhaps your reference may be a contemporary streamlined printing press such as the American French. Chances are, however, that your automatic association will not be the Pin Press. The Akua Pin Press is a portable press in the form of a metal roller, designed by Akua. Weighing only 7.8 pounds, the Pin Press is easy to use and store anywhere. In my case, it is the perfect addition to my home studio. The Pin Press is specifically designed to print monotypes with Akua water based inks. Printmaking at home has never been so safe and convenient. 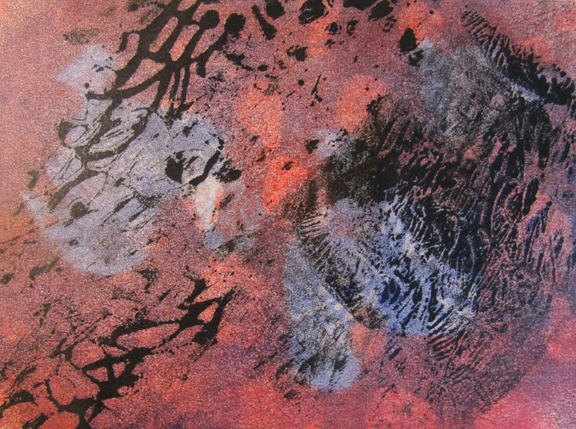 Talleen Hacikyan, monotype printed with the Pin Press, 9 x 12 inches, 2014. I have embarked on a fascinating exploratory journey with my Pin Press. Having always enjoyed building up my images with layers, now with the Pin Press, I add layer upon layer with minimal effort, often working on several pieces at a time. 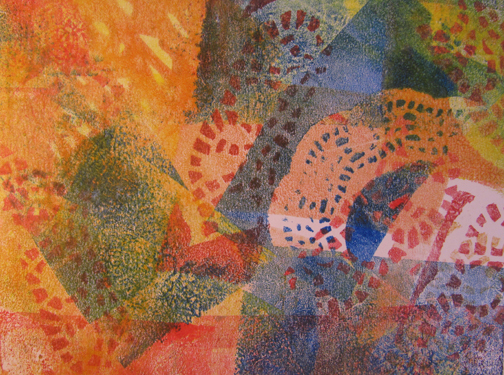 I combine the use of brayers with stencils, stamps and masks, improvising as I go. 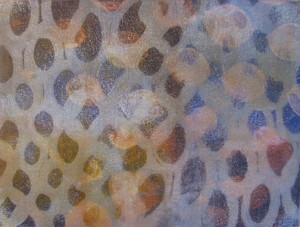 Abstraction has helped me develop a fluid approach where I focus on form, color and texture. This new take on my work is liberating. 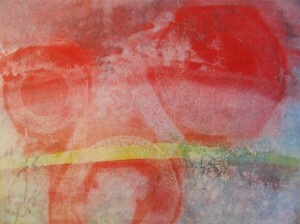 I printed some of my monotypes on dry acid-free Bienfang smooth textured Bristol paper. This paper comes in pads of 20 sheets and is economical and convenient, especially for the exploratory stage. Talleen Hacikyan, monotype on Washi printed with the Pin Press, 10 x 13 inches, 2014. 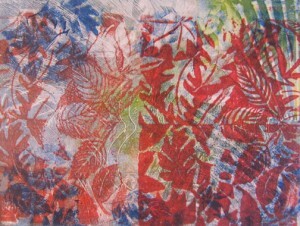 I also printed on dry Washi. Washi Japanese papers open a world of possibilities for printmakers. I bought a few types at Au Papier Japonais. 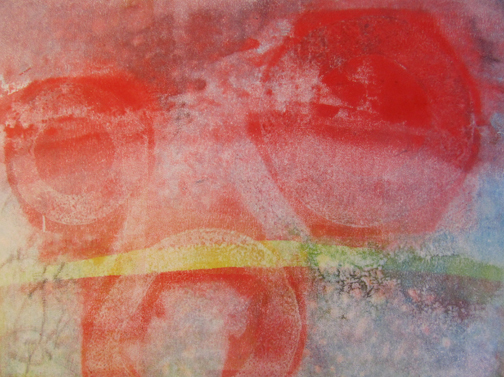 I quite like the soft, almost translucent quality of these monotypes. Talleen Hacikyan, monotype printed with the Pin Press, 10 x 13 inches, 2014. This year I became an official Akua Demo Artist for the Montreal region. I am part of the team of twelve Demo Artists in North America, hired by Speedball, who help spread the good word about Akua inks and the Pin Press. 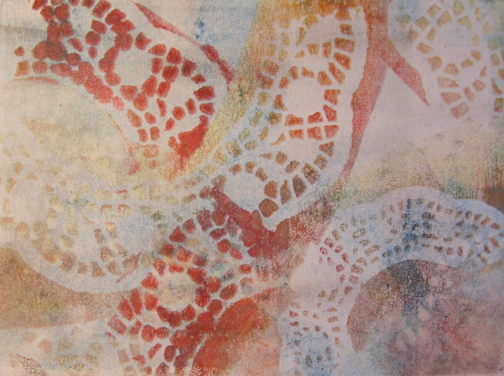 We cover art supply stores, printmaking studios and our demonstrations can also be incorporated into workshops. I look forward to sharing my experience with this innovative, convenient and fun approach to printmaking. 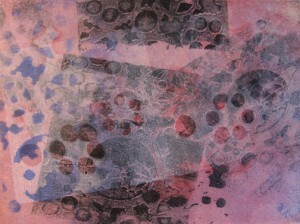 In the meantime, I have a lot more monotypes to print with my Pin Press. 39 requêtes. 0, 178 secondes.